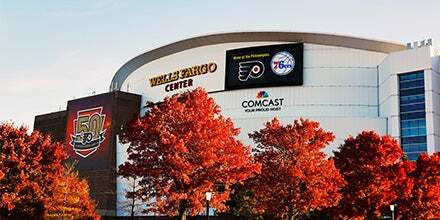 Wells Fargo Center Tours are the only way to get behind the scenes in one of the busiest arenas in the world. You will get the building all to yourself and learn about the rich history of Philadelphia Sports & Entertainment and the Wells Fargo Center’s day to day operations. Tours are approximately 60-90 minutes long, include a commemorative photo and frame for each guest, and will start at the Broad St. Doors. Get a glimpse of the secrets behind how the Flyers Ice is installed and how the venue can host two large scale events in one day. Get a feel for the premium lifestyle. Your group can check out a newly renovated Luxury Suite, experience the sightlines from a Club Box, and learn about the upscale amenities Premium Members have access to including the members-only Cadillac Grille and Corona Extra Beach House. Take a walk around the Wells Fargo Center concourse while the building is empty. You’ll notice things you haven’t seen before.